How should we feel about the feelings of the animals we eat? Acknowledging the sentience of other species requires us to be vegan. Credit: www.shutterstock.com/Ledmark. All rights reserved. In the second half of November 2017 there was a considerable amount of emotion and confusion surrounding the UK’s ‘animal sentience’ bill, which sought to include the notion that animals have feelings in post-Brexit animal welfare legislation. These reactions have been fuelled by the viral sharing of posts on social media claiming that Members of Parliament have rejected the idea that animals feel pain. In fact, MPs did not vote against this proposition. Rather, they rejected a motion that explicitly recognised animal sentience, purportedly so that the Brexit legislation can be passed with as few amendments as possible. In the ensuing public outrage, the Conservative Government issued a statement claiming that the UK will lead the way in animal protection policies. One could argue that UK legislation on animal welfare such as the Animal Welfare Act of 2006 and the Welfare of Farmed Animals Act of 2007 already recognises that animals are ‘sentient’—that they are subjectively aware, and have interests that are manifested as preferences, desires or wants. Anti-cruelty stipulations, of which a considerable number are enshrined in UK legislation, are also premised on the assumption that animals are aware of their feelings and emotions. Critics claim that this body of legislation falls short because it doesn’t include fish, wild animals or laboratory animals; nor does it explicitly mention sentience. But the logic that underpins these laws clearly points in this direction. Not surprisingly perhaps, many people have been quick to assume that a government that seems to relish the gratuitous punishment of foxes and the poor would be inclined to reject the notion of animal sentience. But there is something deeper going on here, and it isn’t restricted to ‘virtue signaling’ as LSE journalism professor Charlie Becket has suggested—in other words, claiming to act ethically without actually doing anything virtuous. “People want to demonstrate their values,” he is quoted as saying in Buzzfeed, and “What can you be more angry about than sentient animals?” Such anger is real, but the more important issue is that accepting the reality of animal sentience (even implicitly) directs us to a set of political positions and personal behaviours that reject eating meat: the belief that it is wrong to cause unnecessary harm to sentient beings requires us to be vegan. What does it mean to say that animals are sentient? A sentient being is one that can experience pain and distress. We cannot be cruel to rocks and trees and other non-sentient beings; we can only be cruel to those beings that are aware of their feelings and emotions. If most of the animals we use in food production systems and other aspects of our lives are sentient, and if we care deeply about this as a moral matter, then two key questions must be answered. Firstly, even if animal welfare laws recognise that animals are sentient, can those laws ever protect the interests that sentient animals have? As Francione noted, because animals are seen and used as human property, animal welfare laws—even the arguably more progressive ones we have in the UK—don’t do much more than prohibit the kinds of gratuitous harm that are in any case economically inefficient. 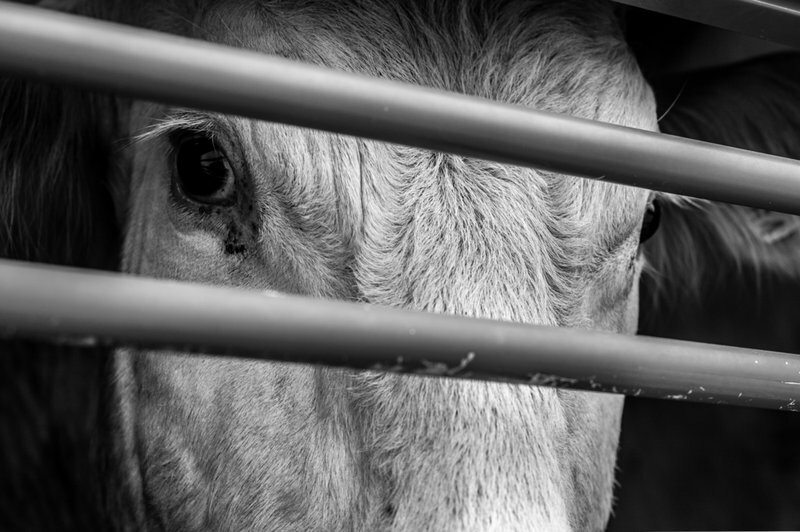 All such legislation comes up against this fundamental contradiction: while it may aim to protect the interests of sentient beings, it cannot do so in any meaningful way while those same beings are the property of another. In terms of sheer numbers and scale, the most significant use of animals is for food. It is estimated that over one billion animals are killed for food every year in the UK alone, yet no one—nutritionists and medical experts included—maintains that this is ‘necessary.’ In fact, there is evidence that vegans live longer lives than non-vegans. Eating animals isn’t essential for good health or wellbeing; we do it because it is customary, and because we like the taste of their flesh. But are those good reasons to inflict suffering and death on a sentient being who, by definition, seeks to avoid pain and to continue to live? The fact of the matter is that there is only one way to respect the sentience of living beings, and that is by being vegan. Being vegan means refusing to treat animals as property, refusing to participate in their exploitation, and avoiding as far as is possible the degradation of the conditions required for their well-being. Veganism is sometimes painted as an extreme—even aggressive—life-style choice. The contrary is true. It’s actually a matter of respecting sentience and rejecting violence—values that so many people claim to share. Indeed, for those of us who profess to care about animal sentience, veganism is a moral imperative. If we are to avoid the charge of virtue-signaling, then respecting animal sentience requires us to be vegan.